If you are using version 4.0 or earlier, please download version 4.0a to correct an issue with the Cluster icon. You will also need to redownload the optional display-size add-ons if you use one. The optional GroupMembers Display add-on is not affected by this change. An alternative to the standard circles used by EQ2MAP to denote various types of points of interest. I really like the alternate Icons but it eliminates the blinking red X. I know that many do not like it but with the Spoiler add-on it makes having the Red X really nice. I compared the dds icon file with the original dds file and I noticed that the X icons are not in the alternate file. I added the missing graphics to the DDS file but the blinking Red X still doesn't show. Is there something else I am missing or would it be possible to get the Alternate Files with the Red X as well? Thanks for your efforts in this. I do appreciate your work. Last edited by hiroprotagonist : 04-23-2006 at 06:46 PM. Ok, it appears as if a problem with the auto-updater that was overwriting this file has now been corrected. The file should remain intact after running the auto-updater. The problem that I'm having is that I tried the 8x8 6x6 and 12x12 add-ons but they don't seem to actually affect anything. Are they now obsolete or am I doing something wrong? Any help would be highly appreciated. Thank you. using Auto updater with these icons? Ok first of all, I just installed eq2map program not long ago and so far it works great. I just found these alternate points of interest icons and wanted to use them. The installation instructions say to put in my custom UI folder. I put it in the EQ2maps folder and try to launch, but the eq2maps program just overwrites it. Am I going to have to place this in a seperate UI folder and then load that UI after the game starts just to get the icons? Or can I set the auto updater for the eq2map program to ignore the icons file? (Maybe I should go post there as well). Just trying to find the easiest/best way to do this. Thanks! Is there anyway we can see the Actual size of the different Icons ? I am currently using 1280 / 1024, and I am just not sure which size would be best for my screen. I prefer to not try and download all three. Perhaps an 'Actualy size' image ? Maybe a suggested size based on common screen resolutions ? Looks like a great addition to EQ2Maps WHICH I LOVE !!!! I downloaded everything and for some reason the new icons do not display. I pretty sure I followed installation instructions. I still see the standard circle icons etc. Make sure you've run the autoupdater. You may need to delete your eq2ui_mainhud_map.xml and then rerun the auoupdater. GroupMembers are, after all, a fairly new feature and you'll need the latest version of EQ2MAP for them to work correctly. Update: I was wrong, sort of. This is one of those files that the EQ2MAP Updater will only download if it doesn't exist. That means if you've run the updater and you still only see red circles for groupmembers, grab the Individual GroupMembers Icons add-on avaiable from the patches/add-ons section of this download. Do you have to modify any .xml to make the new group members icons you made, work? I tested tonight and it was still showing the standard, red ball, for the second guy in my group. I play at 1600x1200... could you possibly make a version where the icons are 15x15 or 20x20 isntead of 10x10? Edit: Just found out I can't go over 12x12 without a near-total overhaul to EQ2MAP, and that ain't gonna happen. So it looks like I'll be working on an 8x8 and a 12x12 version of the display size add-on for those that want things a smidge bigger or a smidge smaller. Sorry I can't accomodate a 15x15 or 20x20, but if you think about it that would really just clutter up the map, since the map size isn't changing in relation to the PoI icon size. Last edited by ger : 04-08-2005 at 01:05 PM. 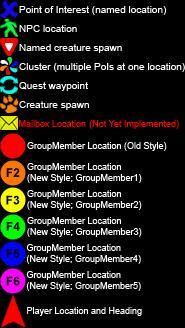 New versus old style groupmember icons are determined by a new window style XML Quib worked up. As soon as it's up on the autoupdater your interface will switch over automatically. Last edited by Goldi : 04-08-2005 at 06:08 AM.